The Academy of Culinary Arts was set up in 1980 by a coterie of top chefs with a shared vision. They wanted to educate young people about the joys of good food. Albert Roux has been involved with the charity for the last 20 years and, catching up with him on his visit to Ullapool High school in the northwest highlands, it was clear that he has considerable cachet amongst the students. As well he might. 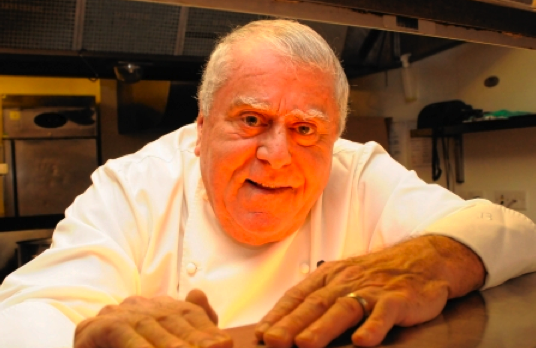 Monsieur Roux has lived in the UK for over 50 years and he, along with his brother Michel founded Britain’s first three starred Michelin Restaurant – Le Gavroche in London. And, of course, the kids have seen Albert’s son Michel junior on BBC’s Master Chef Programmes. Albert visits five Highland schools three times a year to give cookery demonstrations and to talk about food. This is part of the ‘Adopt a Chef’ scheme during which fourteen year old pupils are assisted in the preparation of a three course meal for which members of the community can buy tickets. A lot of the ingredients are donated and all proceeds go to charity. In Ullapool, a community room adjacent to the high school was transformed into a dining room. Tables were adorned with cloths and flowers and the walls were hung with tartan fabric and heather. The menu featured seafood terrine, pot roasted lamb and cream of rice pudding with apple sauce. True enough, a beaming team of around thirty 14-year-olds worked together to cook and serve a meal which – along with wine – was well worth the ticket price of £20 a head.